The European Defence Agencies (EDA) multi role tanker transport program lead by the Netherlands is entering the contract phase in July. Aimed at increasing air to air refuelling capability and interoperability EDA countries Belgium, France, Greece, Hungary, Luxembourg, Netherlands, Norway, Poland, Portugal and Spain signed a letter of intent to purchase a MRTT aircraft. Both Boeing with its KC-46A Pegasus and Airbus D&S with the A330MRTT received a request for information resulting in Airbus being selected to start the negotiations leading to the purchase of their aircraft. During the European Air Refuelling Training exercise media briefing at Eindhoven Air Base Royal Netherlands Air Force colonel Jurgen van der Biezen, Head of EATCs functional division, provided the latest information of the MRTT program on behalf of his colleague Col. Johan van Soest, base commander Eindhoven AB and the MRTT program leader who could not join the meeting due to other commitments. The negotiations with Airbus D&S will enter the final phase. Based on the current program planning the Memorandum of Understanding (MOU) will be signed during the NATO summit held in Warsaw, Poland on July 8-9. Signing of the purchasing contract is planned to take place at the Farnborough International Air show July 11-15. EDA members Luxembourg, Poland and the Netherlands will be the first countries in the program contracting three A330MRTTS. The first aircraft will be delivered in 2020 with full operational capability (FOC) to be achieved during the summer of 2021. With the Netherlands being the program leader the aircraft will be registered in the Dutch register and thus receive RNLAF registrations. It’s possible other countries will join the A330MRTT program at a later moment. Belgium, Germany and Norway have expressed their interest to join the program. It’s currently expected that a total of eight A330MRTTs will be purchased. OCCAR (Organisation Conjointe de Coopération en Matière d’Armement) is supporting the procurement phase while the NATO Support and Procurement Agency (NSPA) will be responsible for the operations and sustainment of the A330MRTT fleet. Utilization of the aircraft will be similar to the current operations of the Strategic Airlift Wing based at Papa, Hungary operating the Boeing C-17A on behalf of its member nations. 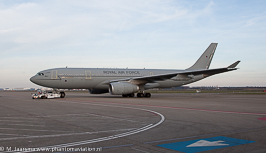 Once delivered the A330MRTT will be operated from Eindhoven AB with Poland and possibly Norway providing a forward operating base. 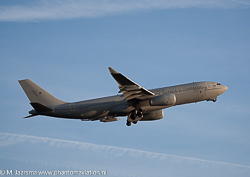 Within Europe only the RAF operates the A330MRTT designatedVoyager KC2/3.